Kangaroo Amp Covers In Vintage Guitar Magazine. Here is a Link to Vintage Guitar Magazine's Article on Kangaroo Amp Covers. Once upon a time, Steve Purcell, proprietor of Kangaroo Amp Covers, grew weary of being the forgetful type. As a gigging guitarist, he never had a problem remembering to pack his guitar and amp. But sure enough, too often the “little stuff” – his cords, picks, pedals, etc. – wouldn’t make it either to the gig or back home. Then one day, inspiration struck. He thought to himself, “Wouldn’t it would be cool to add pockets to my amp cover to keep track of my stuff?” So, with help from a relative, he designed and made one. Soon after, his musician friends started hitting him up for their own. Purcell knew he was onto something. Flash forward a few years; Purcell and his wife/partner, Pam, obtained a patent on his side-pocket cover and begin manufacturing in a 90,000-square-foot facility. 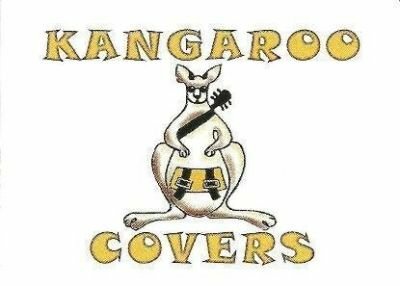 Today, Kangaroo covers are available in two basic styles, one made of 1050 Denier Ballistic nylon, and one in heavy-duty textured vinyl. 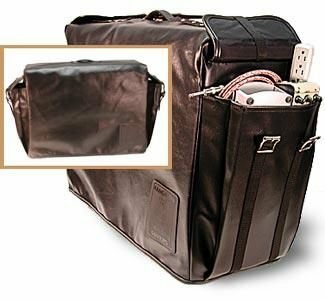 Both are available with or without side pockets, and all feature 3/8″ padding in front and back, leather-reinforced handle opening, reinforced double-stitch inside seams, and a custom fit. Kangaroo stocks covers for many popular amp models and will make covers to fit any amp, and they offer custom embroidering. We sampled two Kangaroo covers cut to fit a 2×12″-style combo amp. The construction and quality of materials on both is impressive; the thick, ballistic nylon looks nearly indestructible, while the vinyl has a high-quality leather look and feel. All stitching is well-executed, with no loose threads or sloppy seams, and the padding and material make it a breeze to put the covers on and take them off. The side pockets were big enough for several cables, as well as several pedals (including a wah or Ernie Ball-style volume pedal), and luggage-grade plastic buckles help ensure the pockets hold things securely. The only consideration one must make when stuffing the sturdy pockets would be the potential for overload; if you’re already hefting around a Fender Twin with JBLs, and you’re staring at the low side of flight of stairs, your Kangaroo’s stuffed pockets may contribute to the forced removal of handle from amp, or a forced visit with your chiropractor! Still, whether your amp is a valuable vintage piece, high-end boutique, a good ol’ gigger that’s taking a beating in the back of the trailer, or a new one you want to keep looking new, a Kangaroo cover is a fantastic solution.